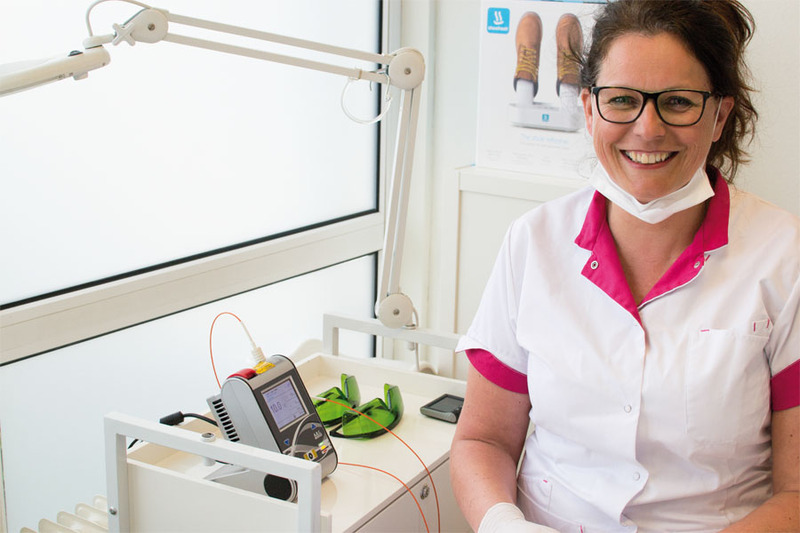 Podiatrist Petra van den Bolt is always looking for new idea's to improve her service. Recently she discovered the Shoefresh, a device which tackles bacteria and fungi inside shoes. She likes to tell how she benefits from using the Shoefresh in her practice. Extra service in my practice. Petra discover the Shoefresh on a podiatrist event in 2014. "I suddenly saw this beautiful white device that uses ozone technology to tackle bacteria and fungi, and also dries shoes. I immediately saw its potential, because for me service is very important. During the treatment of my client's feet I can now also refresh their shoes. This works great and my clients now leave my practice wearing fresh and warm shoes. For treating fungal nails, Petra uses the FOX Laser. "A big investment, but very effective for the first part of the treatment. But, re-infection from the shoes is always a big risk. To decrease this risk I use the Shoefresh. Where the Shoefresh started as an extra service, it has now become very important during the treatment of nail fungus. And the ozone-technology really works! Thanks to the Shoefresh the fungal nails stay gone a lot longer / more often". "I treat the shoes of my clients in my own practice. But it is even better if my clients treat their own shoes at home every day. Because the more frequent the use, the more effective. The Shoefresh is also affordable for individuals.